Full Wrap Seats and Backs are available. Customer’s choice of fabric or leather. You may choose from hundreds of fabric styles or leather colors in stock or supply your own to further customize your dining room set. 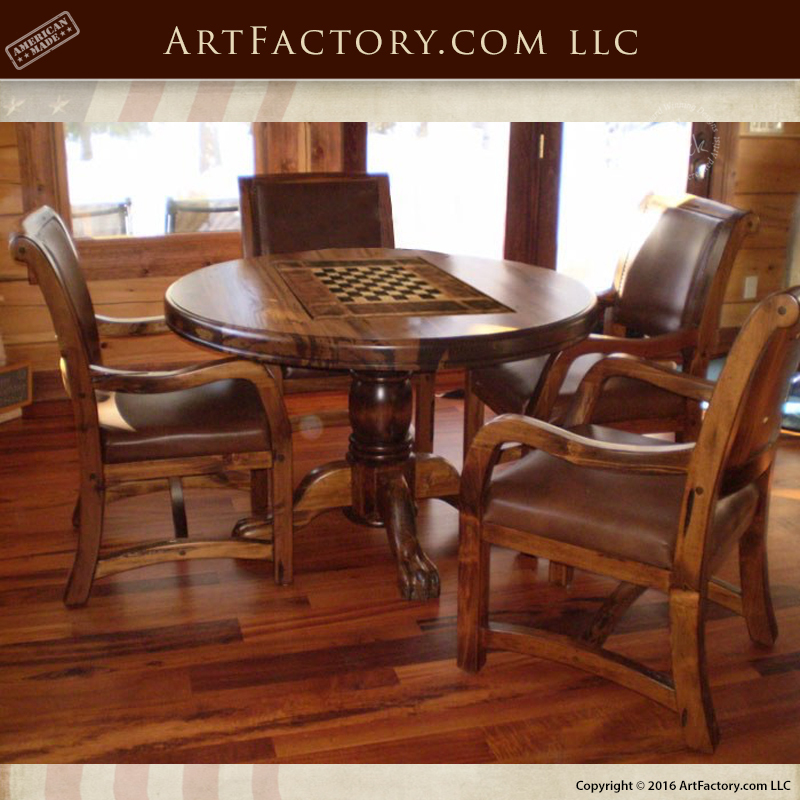 A Game Table Your Wife Will Approve Of – Fine Art Furnishing – Solid Ex Cedar – Designed From The Historical Record – Hand Hewn, Mortise And Tenon Joined – All Species Of Woods Are Available – Structural Frames Using Solid Full Length Timber (no fake laminates, scarf joints or glued up parts,no veneers – no glue ups – no bolt on legs) – Master Craftsmanship That Insures Your Furnishing Will Stand The Test Of Time – A True Family Heirloom And Valuable Antiquity – All Carving Is Hand Carved By Our Master Carvers (no cnc or faux casted resin carving) – Fine Art 10 Process Hand Rubbed Finished To World Class Antique Collectors Standards – ( no spray on faux fast paint jobs ) – Master Blacksmiths Solid Hand Forged Wrought Iron – (no castings or hollow faux metals) – All Heat Applied Iron Oxide Hand Patina Finished – (no powder coating or faux paint on iron finishes) – Genuine Natural Stone – Top Grain Leathers (processed American tanneries only ) And Fine Fabrics Also Available – Guaranteed Forever – Order Any Size Or Style- Backed By Our Over Nine Decades Of Fine Craftsmanship Since 1913! Designs By H J Nick and ArtFactory.com a handmade in America custom furniture manufacturer based in Scottsdale Arizona has been designing and building some of the worlds finest furniture for some of the world’s finest interior designers with ordinary clients as well as most prominent and successful Persons,C.E.O.’s,leaders,royalty and celebrities for the last 97 years. Most of our clients want a furnishing that has a BIG WOW factor and elegance. All want investment value and furnishings that makes a proper statement reflecting their personality or the personality of the environment for which it is intended. Hand carved exotic solid old growth woods and burls used along with the perfection of a signature fine art hand rubbed finish lets every one know that this furnishing is special. Each furnishing is made to order and fits the personality of each client. Some times the hand carvings are copied to the design of other fine art collectables or it may be art taken from personal photos,coats of arms etc, that have family meaning etc. Details As Shown: French Round Dining-Chateau de Larressingle Style 13th c RDT2340 Solid Northern White Cedar – Exotic Natural Core Wood – 42″ Round X 28″T. This Table is hand hewn to shape and features a 3″ thick top. Solid joined and interlocking and is permanently mounted to the 4″ thick solid timber table top. This handmade dining table is hand hewn, pegged, mortised and tenon joined to form a solid mass that will never become weak or wobbly. Each leg includes a mar proof leveling foot allowing this table to be leveled on any floor. Details As Shown: Matching Low Back Arm Chairs Solid Northern White Cedar – Exotic Natural Core Wood – 23″W X 25″D X 40″T.. This size chair allows an adult comfortable sitting and a dining space of 24″ (unlike most production tables with only 18″ sitting space). These matching chairs are hand hewn, joined and doweled to form a solid structure that will never become loose or unstable. The posts are 2 3/4″ X 2″ and each chair leg has a mar proof button foot. The orthopedic slight pitch of the back allows for the most comfortable dining seating. These furnishings are truly custom and that means you may order your chairs to fit your particular comfort requirements at no extra cost. Upholstery : Full Wrap Seats and Backs are available. Customer’s choice of fabric or leather. You may choose from hundreds of fabric styles or leather colors in stock or supply your own to further customize your dining room set. Details As Shown: Finish, Color: Medium Walnut Lacquer Matte – Exotic Cedar – Light Distress northern white core wood exotic cedar. Our processes includes five to ten coats of hand rubbed furniture quality clear oils or water based non-toxic lacquers. It is applied, cured, rubbed and re-applied depending upon whether your order is limited edition or old growth original works. Every surface of this table and chairs is finely finished including the undersides and hidden areas. These furnishings are built to investment family heirloom quality and are finished to be virtually maintenance free and will stand the test of time. You may choose the natural color, from over 400 standard stain colors or computer color match to any color stain. Most of our finishes are water based and earth friendly. You may order any color or texture finish at no extra charge.